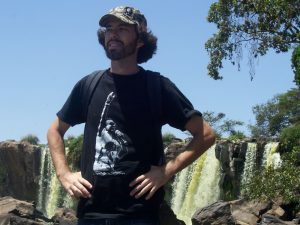 There’s a New Doctor in Town | Hujambo! Move over, Nairobi-based traditional healers, there’s a new doctor in town! 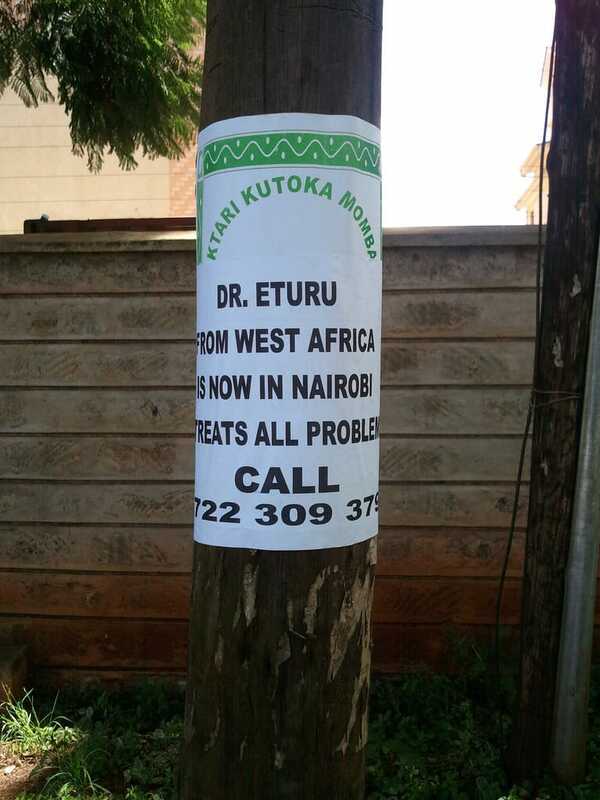 His name is Dr. Eturu and he’s come all the way from West Africa to heal all of Nairobi’s problems. I was walking down Rhapta Road to Westlands with Cassandra and Sammy today, and I cracked up when I saw this guy’s advertisement—specifically that he is from West Africa. It’s not uncommon to see “doctors” from Mombasa or Tanzania, but this was definitely a first. From what I know about traditional healing, it’s all about where you come from. For some reason the Swahili people have a reputation for being more gifted healers than people from anywhere else in East Africa (except the Kamba people of Kenya, who are also known to have a strong link to the world of witchcraft). Now, I always knew Nigeria had a burgeoning film industry (“Nollywood”), but this is the first I’ve heard of their traditional healing prowess! The really hilarious thing was that everyone one of Dr. Eturu’s posters was posted directly on top of the green daktari kutoka Mombasa (doctor from Mombasa) posters. I wonder what he’s got against that doc? It’s almost like the turf wars between drug dealers in that awesome TV show The Wire! Strangely, he didn’t touch any of the other half dozen signs we saw… maybe they’ve got a coalition or something. While I do think all this is hilarious, it’s also sad to see so many of these kinds of scams going around. I don’t doubt these doctors are making a bunch of money from people who don’t know any better. For what it’s worth, I have no problems with natural remedies to common ailments—because there are scientific reasons those work. I do, however, think it’s wrong to tell people you can cure things like tuberculosis, STDs, boy/girlfriend problems, or unemployment simply by boiling some leaves in water or tying a string around someone’s pinky finger (or whatever the hell it is they do). Next: Used Car Salesmen Are All the Same!